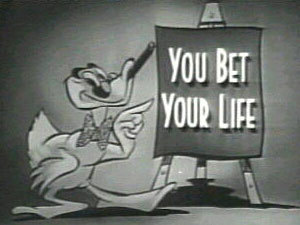 You Bet Your Life is an American quiz show that aired on both radio and television. The original and best-known version was hosted by Groucho Marx of the Marx Brothers, with announcer and assistant George Fenneman. The show debuted on ABC Radio on October 27, 1947, then moved to CBS Radio debuting October 5, 1949 before making the transition to NBC-TV and NBC Radio on October 4, 1950. Because of its simple format, it was possible to broadcast the show simultaneously on radio and television. June 10, 1960 was the last episode aired in its radio broadcast format.